The stage was set for an exquisite evening. We had just finished cocktail hour in the gorgeous Manhattan Lounge at the St. Regis Saadiyat Island Resort in Abu Dhabi and were headed out to meander through the lovely grounds to Sontaya Restaurant. As I pushed open the door to the outside and noticed the distinct lack of humidity and heat that had plagued the area over the last few days, I was glad that an outside table was the only one available at the time we’d requested. 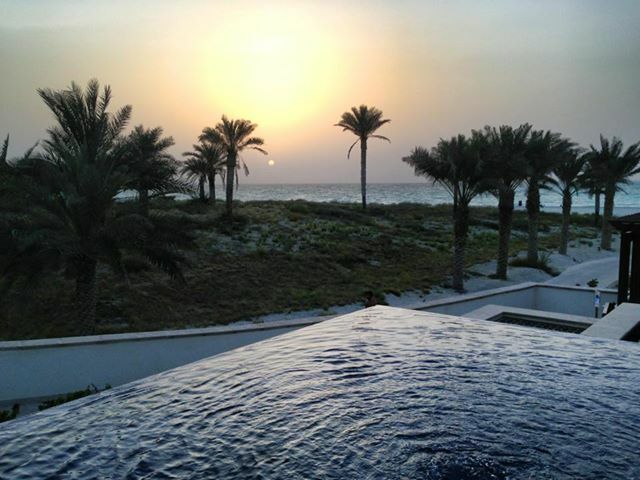 The sun began its descent into the Arabian Gulf as we were seated. We ordered drinks and scanned the menu, and I snapped photo after photo of the sunset and the perfect deck that we perched upon, set above bubbling pools and waterfalls. I had been waiting for an evening like this for some time. The lovely server explained to us that since the previous evenings had been so incredibly hot and uncomfortable, they had booked most of the reservations inside the dining room. We had the deck to ourselves, save a Filipino nanny and her young twin charges. They were winding down their meal and departed before our first round of drinks arrived. We were blissfully alone. I noticed him initially for his lack of adherence to the dress code. When the hotel sent us a confirmation of our reservation, the request for smart casual attire was noted. Men must wear trousers, collared shirts and closed shoes. He sauntered to a table for six, right next to ours, in board shorts and flip flops, but, as it was early, I assumed the staff simply made an exception. He sat alone but asked for kid’s menus as well. A few minutes passed and our appetizer arrived. As we were divvying up our savory chicken satay, two women and two young girls arrived at the bottom of the steps that connected the outdoor dining area to the beach pathway. The man shouted to them as they realized that the gate was locked, and the ladies loudly declared their intent to walk to the proper entrance of the restaurant. So daddy, being the good chap that he is, lifted her and the other, older, girl over the gate. The younger girl galloped loudly up the wooden boardwalk-like steps and all hell broke loose. It was easy to ascertain that the smaller girl, probably four or five years of age, was called Ava. How do I know that? This is all that I heard from daddy, mummy, and auntie over the next forty minutes. Of course, having undoubtedly heard all of these empty threats many times before, Ava couldn’t be bothered listening to such tiresome rubbish. She was intent on doing exactly her own thing, and nothing her parents said or did would change that. Most likely because she knew her parents would do exactly that. Nothing. Little Ava proceeded to press her face and hands on every available window into the dining room, and make faces at the patrons. She went to each empty table on the deck and touched every glass, knife, fork and spoon she could find. Then she rearranged the settings into something that suited her fancy. Then, to really get the look that she was after for her table creations, she began to lick each piece of flatware before she set it down again. What were her parents and aunt up to during this fiasco? They were trying to decide between the Pinot Grigio and the Rosé, wondering if chicken noodle soup in an Asian fusion restaurant would taste like the canned variety, and deciding amongst themselves who had “kid duty” for the remainder of the evening, so the others to go out for cocktails. Ava was expressing her delight at the situation by stomping her obviously steel-shod feet up and down the wooden deck like a prancing Clydesdale. Additionally, in case no one could hear her, she vocalized her actions with a rousing rendition of that classic hit, “Stomp, Stomp, Stomp!” Quickly bored of that, she went back to one of her favorite pursuits, flatware licking. Despite the fact that I would have loved to have stayed on that deck for an after dinner drink or two, we asked for the check as soon as we were done. While my husband signed for the bill, I noticed the hostess seating two older women at a table near us. A table that had just had its flatware swabbed by the tongue of little Ava. And the hostess had no idea. On our way out I quietly informed our server that a replacement set of silver and glassware might be in order for the tables that had been in the swath of Hurricane Ava, and we made our way to the door, seething and laughing at the same time. Am I wrong in thinking that parents should be more considerate? If you’ve always secretly desired to have a little blonde tyrant crack the proverbial whip in your life, that’s your choice, but it certainly isn’t mine. A child under my watch in that situation would receive a very stern tongue-lashing. But it seemed as if the only one doing any tongue lashing here was Ava. And that flatware has the DNA evidence to prove it. When you’re paying money for a beautiful dining experience. Inconsiderate parents / nightmare kids are the last thing you want ruining your night! I think you did well not to leave earlier. Hope it didn’t completely damage your evening. Our evening wasn’t totally ruined, but I still can’t help but wonder what, exactly, goes through a parent’s mind in a moment like that. Can’t you see that your child’s behavior is affecting other people? I guess I may never know. Ugh! I would like to think that I’m not becoming some horrid, cantankerous, wench but it is like a cheese grater on my nerves when I go somewhere and there are children running amok. I try and be patient and understanding, but just it seems like it’s becoming easier to abandon teaching children boundaries and opt to raise sociopathic narcissists instead. Patience with children is usually a given in my book. Patience with parents who just don’t seem to care? Not so much.